October 31, 2018 -- Gallium-labeled prostate-specific membrane antigen (PSMA) PET/CT is gaining ground in primary prostate cancer staging, delegates heard at last week's online meeting, Conference on Hybrid Imaging Live (CHILI), held in Barcelona, Spain. 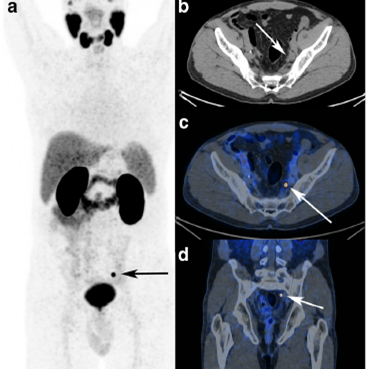 "PSMA PET/CT significantly increases the sensitivity and specificity for detecting metastasis in primary staging, and also for biochemically recurrent disease with respective therapeutic implications. It therefore has the potential to serve as a guidance tool in clinical decision-making," he told AuntMinnieEurope.com. "The particular value of PSMA PET/CT has been shown in the detection of small lymph node and bone metastases that would go undetected by conventional CT. First studies show that a metastasis-directed therapy approach based on PSMA PET/CT improves patient outcome," noted Cyran who is professor of radiology and section chief of hybrid and molecular imaging at Ludwig Maximilian University (LMU) in Munich, Germany. "Looking at the time it takes to send a radiological contrast agent through phase studies, this is very impressive and helps us to have some hope for innovations that may be coming," he told viewers during the meeting, organized by ESHIMT and European Society of Radiology (ESR). Cyran further explained it was possible to get approval in such a comparatively short time due to Germany's legislation that allowed PSMA's clinical adoption for compassionate use. Such legislation gives doctors the option to use novel tracers to change the way therapy and diagnostics work, making the process more comprehensive and efficient for the patient, he added. "We know on a certain level a reactive uptake of PSMA can also be present by means of inflammation ... This can raise the insecurity in differentiation of possible lymph nodes and lymph node metastasis. The situation is always better if you are not in the immediate postradiotherapy stage or postoperative setting," Cyran responded. "No one would recommend performing a PSMA PET/CT one week after radiotherapy," Ilhan told listeners. Cyran agreed: "The data available points to performing the PSMA PET/CT scan before you plan the target volumes. So perform the scan before you do the radiotherapy," he said, illustrating this with a study that showed a change in 87% of target volumes following PSMA PET/CT. "Even with a busy schedule, most doctors can spare 90 minutes to connect to an online conference and simply listen in to the session that interests them and is most adapted to their personal level of training," Cyran said. "The overwhelming conclusion from survey results was an integrated curriculum is needed to allow radiologists to learn about nuclear medicine, and nuclear medicine doctors to learn about radiology, so that one person could report on hybrid imaging scans, instead of the current requisite for the input of two specialists," Cyran said. "There is an emerging consensus in both specialties that an integrated training curriculum in hybrid imaging should be established to allow integrated licensing for hybrid imaging throughout Europe." The meeting's program started in the morning with the basics of hybrid imaging aimed at first-time users or residents and moved to more sophisticated areas of the technique throughout the day, via a session later in the morning on its main use in oncology, and a session on other emerging indications in the early afternoon. These were followed midafternoon by a session on the future of hybrid imaging that included a presentation by Prof. Irène Buvat about the added value of artificial intelligence for both PET/MRI and PET/CT.